You have until 3 p.m. EST this Monday, December 1st, to submit “your favorite ridiculous winespeak word or phrase” to Ed Levine’s delightful Serious Eats site. Five lucky submitters will be awarded a free copy of The Wine Snob’s Dictionary. For those who don’t win, hey, the book is still just thirteen bucks a copy–a recession-friendly stocking stuffer. The original Orange Juice: from left, David McClymont, Edwyn Collins, James Kirk, and grumpy old Steven Daly. 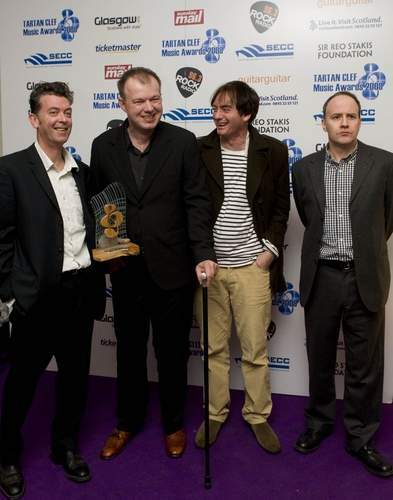 Steven Daly–retired drummer, pending dad, daytime drinker, journalist, and co-author of The Rock Snob’s Dictionary–was in Glasgow last weekend to accept a Lifetime Achievement award at the Tartan Clefs, the Scottish music industry’s big bash of the year, which raises funds for the Nordoff-Robbins Music Therapy organization. Steven, for those who don’t know, was a founding member of Orange Juice, the post-punk group that kick-started Scotland’s indie scene by founding its own label, Postcard, and making smart-assed pop music with funk inflections. The Orange Juice reunion–the first time the original lineup had been together in the same room since the early 1980s–was all the more poignant because three years ago, Edwyn Collins, the group’s singer, songwriter, and leader, suffered a massive brain hemorrhage that forced him to learn to speak, read, write, draw, and sing all over again. Edwyn recently wrote a moving piece for the U.K. Guardian about his recovery, which he credits to his wife’s persistence and his penchant for drawing birds. More Rock Snob-arousing photos of the reunion are forthcoming from Steven.